The future of the production of common bricks required new technologies: KELLER ICS offers the technologie of future-oriented machines for each filling material. Due to comprehensive know-how, top service and technical first class performances KELLER ICS is the right partner for the development of filling plants. Decide yourselves for such an individual solution. We are well prepared advising you and are looking forward establishing together with you the basis for your success. With this type of filling, variations are no problem. The system fills common bricks with any hole patterns. In the filling plant, the bricks receive a perlite filling by means of a filling system specially tailored to the product. 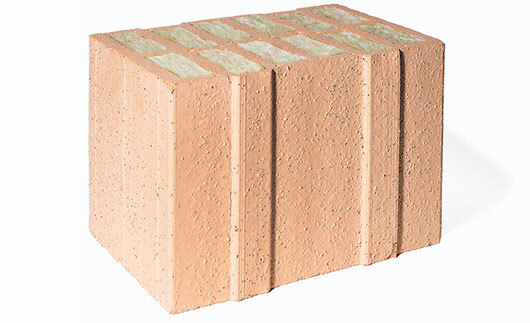 The gentle process guarantees the best possible result: high-quality insulating bricks. This type of filling is especially tailored to common bricks with uneven hole patterns. The plant works with a system, which is adjusted to the brick type, filling the bricks with mineral fibre mats. In this way, robust insulating bricks of high quality are produced. Mineral granulate is mainly suitable for use with finepored hole patterns. In this field, the plant works with a high degree of sensitivity. Perfect filling of the insulating bricks guarantees a long service life. The energetic requirements for their building materials prompted Röben Tonbaustoffe GmbH to introduce new thermal bricks into theirsupply range. The range of highly heat-insulating common bricks fi lled with mineral wool was extended by the thermal bricks TV 7 to TV 10 with a heat conductivity of 0.10 down to 0.07 W/mK. With its range extension, Röben reacts on the increased demand for innovative wall building materials. In order to integrate the necessary plant solution in the best possible way into the existing infrastructure at their Reetz site in Brandenburg, they opted for KELLER ICS, a high-tech partner and specialised plant supplier, who already provided convincing technical and economic answers in numerous comparable reference plants. Both companies already successfully worked together on several occasions. Their last joint major project was the development and commissioning of the complete plant of the new Röben factory in Bannberscheid near Montabaur in 2009. With this current project, they again succeeded in implementing an optimal plant solution within a very narrow time frame, and this is undoubtedly attributable to the extensive experience in fi lling technology the KELLER engineers gained over the years. Besides economic aspects, the modern residential housing sector sets its focus on ecological, health-relevant and static factors, accompanied by fi re and noise protection. Bricks with integrated insulating material are on the market since the beginning of themillennium, but only with the energy requirements of the energy saving regulation (EnEV) introduced in 2009 they became the new standard in Germany. This trend continues on a world-wide scale. Bricks fi lled with insulating material are ever more frequently offered abroad. There are different materials which can be used as insulating material: In addition to Perlite and mineral granules, mineral fibres have proved their worth. To fill a natural material such as bricks with the proven mineral wool insulation turns out to be an intelligent combination which, due to the low thermal conductivity of filled bricks, makes all other additional thermal insulation composite systems at the exterior building walls redundant. The new brick fi lling plant complements the existing Röben plant infrastructure as a fully automatic stand-alone solution. The palletised common bricks from the existing brick production and the mineral wool boards are supplied to the plant via a system of chain conveyors. After drying, the common bricks are ground. This has the advantage, among others, that the insulating material can be easily filled. KELLER ICS created the new fi lling plant as a space-saving solution. In a first step, a cutting device cuts the mineral fi bre boards into inserts with a predefi ned size which will later fi t exactly into the brick holes. The cut inserts are then forwarded on a conveyor to the filling station. The fi lling station consists of two lines located side by side. At one side, a high-performance industrial robot de-hacks and separates thebricks and groups them depending on their size. A transport belt then forwards them to the fi lling station. A special sting gripper mounted to a second robot picks up the cut mineral fi bre inserts and puts them vertically into the holes of the ready-positioned common bricks. Exact and uniform fi lling of the brick holes guarantees a homogeneous product quality and the very low thermal conductivity. The KELLER engineers succeeded in uniting high-performance robotics and conventional technology. The fi lling station itself is equipped with a KELLER ICS patented technology which is successfully working in a number of brickworks. This technology allows very short change-over times when changing brick sizes, using synergies during the tool change. This technology also evens out dimensional brick tolerances admissible in the heavy clay sector and also achieves very good filling results with rough brick surfaces attributable to porous structures. Furthermore, the system both compensates for diff erent mineral wool board thicknesses and for dimensional variations within one mineral wool batch. The laid-out throughput of the plant is at present 800 fi lled bricks per hour. If the demand for thermal bricks increases, the KELLER plant design also allows a subsequent output increase. A transfer device forwards the ready filled bricks to the packing installation where they are palletised, heat-sealed and forwarded to the logistics department. The supplied KELLER filling technology commissioned at Röben Tonbaustoffe in Reetz is on the cutting edge of development for ceramic machinery. Again KELLER ICS has shown its expertise in plant engineering for the heavy clay industry. With its compact design and the combination of robots and conventional technology, this plant will again serve as a worldwide reference. For many years now KELLER ICS has been realising the potential of fi lled bricks as a high-tech building material and supplied the necessary intelligent plant technology. With the new brick-fi lling plant in Brandenburg, KELLER ICS contributes to the safety of the jobs at the Röben site and once again proves its engineering capabilities and innovative strength "made in Laggenbeck". Filled clay blocks - an unstoppable trend! The brick and tile industry sets a good example and provides architects and clients with a high-tech product that satisfies already now the building standards of tomorrow and offers high energy savings - the clay block filled with mineral wool inserts referred to as thermo block. Since last summer, Wienerberger has been producing this block also in Austria in a plant implemented by KELLER ICS. The long-established company based in Ibbenbüren-Laggenbeck is proud to have delivered and successfully commissioned, in close cooperation with Wienerberger, the first mineral wool filling plant for clay blocks in the Alpine Republic at the Upper Austrian Haiding site. KELLER ICS representative for Western and Southern Germany, Austria and Switzerland, Dipl.-Ing. MBA Alexander Strauß, reports: "I especially wish to underscore the excellent cooperation between both project teams. We worked together with dedication and full commitment. The result is impressive - the plant was completed in a record time of only 8 weeks." The decisive factor for the decision to award KELLER ICS with the project was the unmatched flexibility the filling plant design offers. For example, the water-jet cutting technology employed together with the patented KELLER ICS filling system can handle almost all panel-type insulating materials. In addition to its high flexibility, the KELLER ICS plant is perfectly suitable to fill also unstable insulation boards with low material thickness into nearly all types of die geometries. This means for Wienerberger that they can react to all needs of a volatile market within the shortest time possible - a decisive advantage no other plant design can offer. New developments will no doubt change the still very young thermo block product group significantly in the years to come. The trend to build with filled clay blocks, however, is unstoppable. Even if the end of this journey is not yet foreseeable: with a KELLER ICS filling plant our customers are already now well positioned to get there in the best way possible.